These trees are in Ocean Beach, San Diego. Prunus lyonii is native to Santa Rosa Island(Wi'Ma), Santa Cruz Island(Limu), Catalina Island(Pimu), and San Clemenete Island(Kinki). 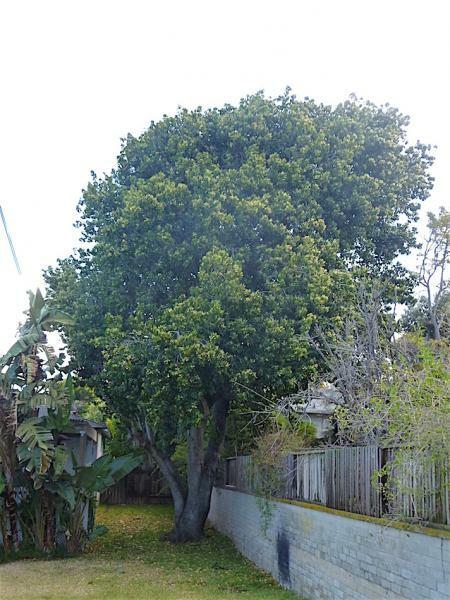 The tree in the photo at top is close to 30' tall, and the tree in the two lower photos is close to 20' tall. Produces black skinned fruit of large cherry size, with clear-white sweet flesh which can be rather tasty and caloric. Some trees have non-astringent 'pure' tasting fruits at the fresh ripe stage, some trees have fruits which need to be over-ripe before the astringency dissipates, somewhat similar as with Hachiya persimmons, but more 'over-ripe'.